Cut 2 Exterior Fabric 10" x 9"
You will also need a Lace zipper. 1. Take all your exterior fabrics, including your handle and pull tab. Exterior fabric set aside. Next, we take the handle piece and pull tab and iron on the SF101 interfacing to the wrong side of the fabric. Now let's start sewing. 2. First, we make your interfaced handle piece, by folding in half long ways with the wrong side of the fabrics touching. Now open back up and take the raw edge into the centre and press, and repeat with the remaining side, next fold it onto itself, so you have all the raw edges into the centre and the fabric is facing out. Now repeat the same technique with the Pull Tab. Take to the sewing machine and using a 1/8" seam allowance topstitch down both sides, using a stitch length of 3, set aside. 3. Now we are going to make our pouch panels, First place Exterior and Lining fabrics right sides together and sew along the 10" side of the rectangles sew a 1/4 inch seam allowance. Repeat with your second Exterior and lining pieces. the lining and Exterior right sides out and pin or clip in place along the bottom end. Making sure that your seam is pressed and the lining is smooth. 5. Next, we are going to remove our Zipper foot and replace it with your all-purpose presser foot. this is important as we will be doing a zig-zag stitch to finish off our pouch, Make sure that your Lace Zipper is open at least halfway. 6. 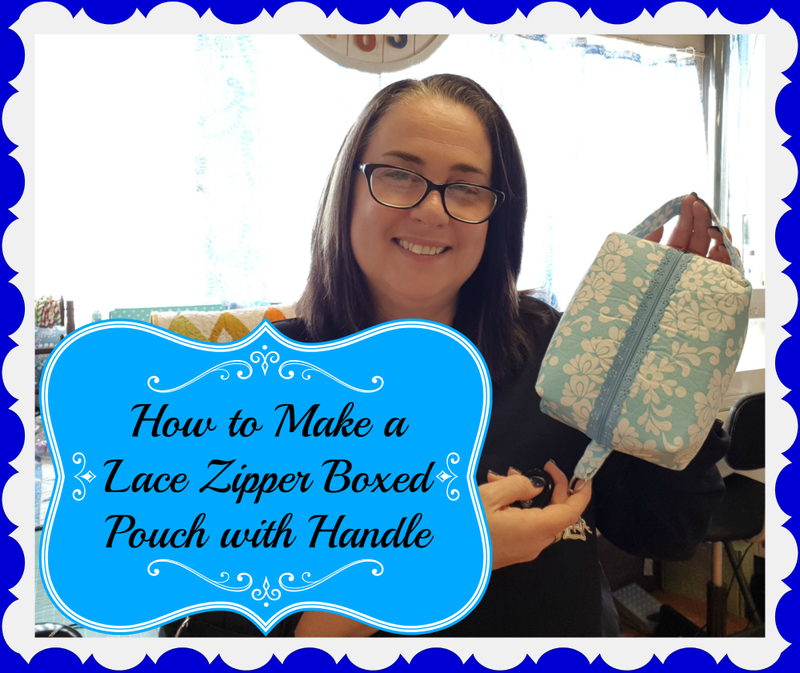 Now that you have sewn your zip in it is time to lay it flat, you may need to trim it up a little so that the zipper is flush with the edge of your panels. Now that you have done this fold your pouch in half with the exterior fabrics right sides together, you are now going to sew a 1/4 inch seam allowance using a stitch length of 2.8 or 3 opposite end to the lace zip as shown in the video. Making sure you backstitch at the beginning and at the end. Next, you are going to change from a straight stitch to a zig-zag stitch. Using a stitch length of 2 and a width of 4 for your zig-zag, now sew right along that raw edge to finish. This will stop any further fraying of your fabric. 7. Now lay the pouch flat with the bottom seam lining up with the zipper teeth, pin or clip, so pouch does not move. Next, take a ruler and on each corner make a mark with chalk or a pen 1.5inch square on each corner. Now that you have done that you are going to take your scissors and cut corners out. 8. Next, you are going to sew the short ends of the pouch, but first, we have to insert the Pull Tab. At the closed end of your zip, not where the zipper pull is when the zip is closed, but at the other end insert your Pull Tab, lining up with seam and the zip (Refer to Vidoe). Making sure that it is centred. Using a 1/4 inch seam allowance sew them close and then you will finish off the seams as you did in step 6. Repeat for the opposite end, but this time you don't have to insert a zipper pull. 9. Time, to box up the corners (refer to Video if need be) at the end where you have the Pull Tab inserted, you are box this end up first. Take one side and close up the opening and pin in place making sure that your seam is laying flat and raw edges are aligned. Now using a 1/4 inch seam allowance sew it closes and again finish with a zig-zag as in Step 6. Repeat with the opposite side. Next, we are going to do the same thing again to the other end of the pouch, but his time we are going to insert the handle into the opening from the inside of the bag. Sew closed using a 1/4 seam allowance. Repeat with the other side making sure that the handle is not twisted. once you have done this you will need to finish with a zig-zag as you did earlier. Turn your pouch right side out and poke out all corners.